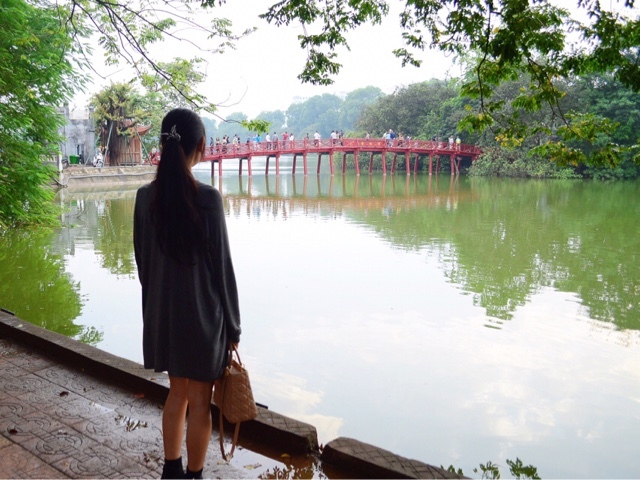 A throwback to when I visited the capital of Vietnam with my travel buddy. Our weekend getaway involved becoming millionaires (in Dong, not GBP unfortunately), spontaneous sightseeing, learning the art of crossing roads, lots of pho and experiencing the coffee culture. We stayed at a hotel called BOSS LEGEND (hell yeah) in the Old Quarter. Our room was massive (although dark wooden interior usually gives off a kinda haunted vibe, no?) and we also made use of the hotel's disco jacuzzi. The Old Quarter is a hub of motorbikes, markets and cultural landmarks. We were 5 minutes away from Hoàn Kiếm Lake and immersed ourselves into some Vietnamese culture via the Thang Long Water Puppet Theatre. Although I couldn't tell you what the show was about because, if there was a plot, it was all lost in translation. The weather started turning cold and murky, so the photos turned out quite grey, but thanks to the little kid who livened up our photos at the lake with his continuous photobombing. The Temple of Literature was also on the agenda, although we didn't make it very far after realising we weren't adhering to the dress code rules plastered over the entrance and decided to past on possibly awkward or disrespectful encounters. No shorts or short skirts, guys! We also had a spa day at La Belle Spa, entailing the best full-body massage I've ever had and also, to balance it out, the most painful body scrub I've ever had too. 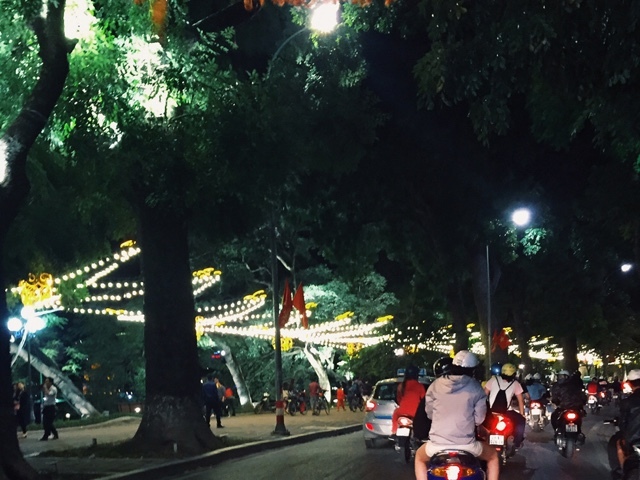 Night-time Hanoi is pretty enchanting - the Huc bridge at Hoàn Kiếm lights up red, lights are strung on trees and motorcycles still rule the road, even at late hours. We toured around the Old Quarter's night life on a tuk tuk/xe lam and also taxi-ed to other parts of Hanoi for dinner. En route to Tràng Tiền, which is kind of down the road from the OQ, it transitions from hipster bookstores to the likes of Diors and Cartiers. Funky B on Tạ Hiện Street was another random find on a bar-hunting mission. Tạ Hiện seems like Hanoi's version of Hong Kong's LKF; apart from whilst everyone stands/drinks/dances/throws up on the streets of LKF, Tạ Hiện is a little more sensible, albeit equally as crowded. Hanoi has a very prominent street culture where the Vietnamese sit on mini plastic stools outside to drink or eat and Tạ Hiện is lined with street food and beer places. It seems to me, that on motorcycles is more convenient to drive in traffic jams. At home, I have my own personal motorcycle and I always use it. And even when I went to rest in Chiang Mai, I also rented there a scooter http://catmotors.net/lease-terms/, so it was easier for me to move around the city and it is more convenient to visit the sights of this city.